Today's computers are faster and smaller than ever before. The latest generation of transistors will have structural features with dimensions of only 10 nanometers. If computers are to become even faster and at the same time more energy efficient at these minuscule scales, they will probably need to process information using light particles instead of electrons. This is referred to as "optical computing". Fiber-optic networks already use light to transport data over long distances at high speed and with minimum loss. The diameters of the thinnest cables, however, are in the micrometer range, as the light waves—with a wavelength of around one micrometer—must be able to oscillate unhindered. In order to process data on a micro- or even nanochip, an entirely new system is therefore required. The silver serves as a kind of intermediary between the gold particles while not dissipating energy. 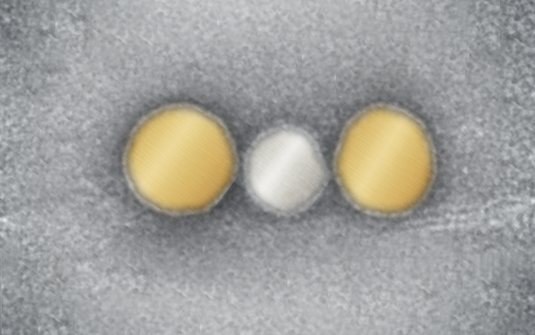 To make the silver particle's plasmon oscillate, more excitation energy is required than for gold. Therefore, the energy just flows "around" the silver particle. "Transport is mediated via the coupling of the electromagnetic fields around the so-called hot spots which are created between each of the two gold particles and the silver particle," explains Tim Liedl. "This allows the energy to be transported with almost no loss, and on a femtosecond time scale." In parallel, the physicists simulated the experimental set-up on the computer – and had their results confirmed. In addition to classical electrodynamic simulations, Alexander Govorov, Professor of Physics at Ohio University, Athens, USA, was able to establish a simple quantum-mechanical model: "In this model, the classical and the quantum-mechanical pictures match very well, which makes it a potential example for the textbooks."